And this is the Estonian fortress from the Russian side. The border is the river and to the right of the photo is border control into Estonia. 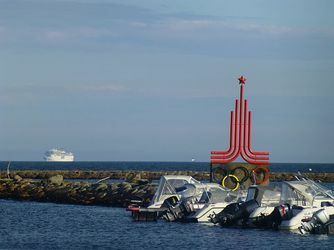 Pirita Harbour was the site of some 1980 Olympic Sailing events. 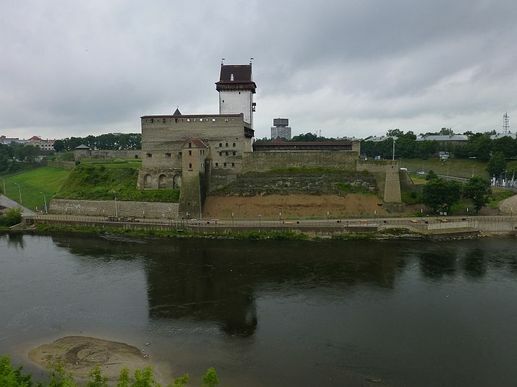 We crossed the border from Russia to Estonia in an hour or so and then visited the Estonian Narva fortress opposite the Russian Ivangorod fortress before driving west. We stopped at Toila Spa where we met up with Zatruk, Deb and Barb. Lazy start as we had a swim in the heated pool of the Toila Spa Hotel. It was only a couple of hours drive to Tallinn where we stayed at the Pirita marina for 2 nights.Tallinn is unusual in that it has an upper and lower town from the 14th and 15th century. The lower old town still has several of its towers and much of its defensive wall. The wall around the lower town was built by the merchants and artisans to keep them separate from the bishops and knights who ruled from the upper town. We went for a pleasant cycle to Kadriorg Palace and through the huge grounds a few kilometres away prior to heading south west toward Haapsalu. 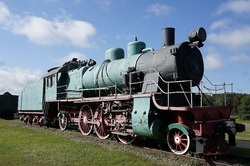 Prior to leaving quiet beachside Haapsalu we checked out the local railway museum which had an interesting report about being drunk on duty (smelling strongly of vodka) in the 1920s. Then we drove to the crumbling hangars, taxiways and runway which had been an interceptor aircraft base during the Soviet era having 38 MiG-23 jets in 1991 before the Soviet Union broke up. Now disused except for locals to do a few speed trials on the runway. 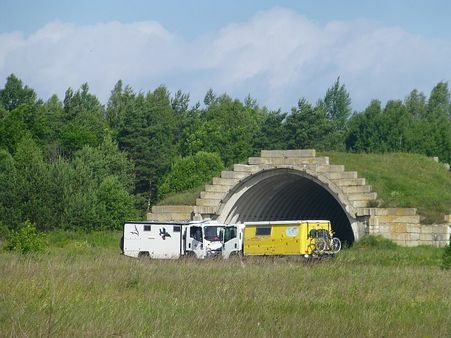 A couple of hours drive south to Soomaa NP which is noted for its very old bogs. We booked in for a canoe trip, drove around to one of the bog areas and then set up camp. Also did the beaver walk after sunset when the beavers are more active. This meant waiting until almost 11pm. Heard a few splashes but saw nothing. Zatruk and Bee nose to nose on the taxiway at Haapsalu. Guy hooking the car on. We were getting ready to do the canoe trip when a guide came up requesting the help of ‘Beetrax’ … he had read the website the night before and felt we were up to the task of pulling a car out of a ditch. Guy and Frank managed it no problem. The two girls on the right were in the car went it failed to take a corner and crashed. We noticed that some fluid had leaked from the car after the girls had driven off. We enjoyed the lazy paddle in the canoe and stopped to walk along the Ingatsi Study Trail to see the bog which rises up to 8 metres above the surrounding countryside. There was a boardwalk the whole way as the ground is waterlogged, soft and spongy and covered in mosses and low shrubs. There were a few pools we could swim in but the water was freezing below the top 30 cms or so. We left the Soomaa and headed south into Latvia.